Thanks to Tammy Trivelpiece for giving this girl a loving forever home! She is so fortunate to be loved by you, Tammy! Living the high life. She looks beautiful. Please send prayers and good thoughts for my former foster Norman who was adopted by Kathy & Mike Burke a year ago. He has had tummy issues (my technical term) on and off since they adopted him in spite of never having any problems while he was with us :( He is down to 16 lbs and has had to receive IV fluids while doctors are trying to figure out his problem. The doctors now think that he has a partial blockage somewhere and are looking to do barium swallow x ray. Today, He was also having trouble breathing and was injected with antibiotics for possible aspiration pneumonia. He is the sweetest boy and is dearly loved by his parents. Thank you for the warm welcome when I joined. I have the privilege of fostering Lucky. Lucky is a sweet, gentle 9 year old boy who loves to play ball. He is an owner surrender. His 90 year old owner passed away about a month ago. The wife could not take care of Lucky so fortunately they contacted NEBTR. Lucky was confused in the beginning but he is settling nicely in my home. He is cat friendly! I have posted a picture so you can see his cuteness. Thank you so much, Nancy, for joining NEBTR and for giving Lucky your love! I’m dog tired and think I might just stay in this position all weekend. Please do not disturb! Here is Augie Ironman! The day after staple removal and he has been walking with all three of our dogs sucessfully now. Slow but steady progress. Augie is looking very dapper. Thank you Gale for the great job you are doing for him. And thanks to all who are donating to his care to make this possible! Porter is doing AWESOME. Porter is greatly enjoying life in the City. He goes right into his carrier for the ferry ride and he is running around the office all day. His new Dad, especially as a first time pet owner, is doing such a great job. He loves Porter very much and is giving him tons of affection, but not letting him get away with any shenanigans. Porter has NOT had any anxiety!!! This is just amazing!! Here are photos of Porter At The Office: chilling on a giant leather sofa having a treat; and sleeping on the job on his Dad's desk. This was such a perfect match. I couldn't be happier!! Sweetie- Working hard or hardly working. She has been the office mascot this week. My first night is tough. I hope Jamie doesn't rearrange my pillows. PRICELESS!!! Cleo is an almost 12 year old little girl who found herself at the Bucks County SPCA Shelter. She was surrendered as the owner is terminal with cancer. Everyone at the shelter said that she is a real sweetheart. Thanks to Kristy Ieraci, who volunteered to open up her heart and home to this little girl, who must be very confused and upset. “This little girl is beyond darling!! She's obviously been taken care of and loved. Her 12th birthday is Oct. 13. She wags her tail non-stop, turns her head when you talk to her--like she could start talking any time. I cannot believe she's almost 12. She's going to be an absolute treasure for some lucky adopter!! She just wants to play!! Well here she is, Frances!!! She is 3 months old and a bundle of happy joy. It was impossible to keep her separate from the pack, they busted through the gate, ready to play with her. She is ADORABLE, SMART, FUNNY, INQUISITIVE, GENTLE, LOVING AND HAPPY. She is amazing. It is too hard to get pictures of her, she just runs all over the place!!!! Awww, you can't watch that and not SMILE! :) Thanks so much, Ellen, for all you are doing for her! Popeye wants to say thank you for his box of goodies! He loves his bones, bed, and leash! Fiorello and Wisteria are living life large with Julie Klam! 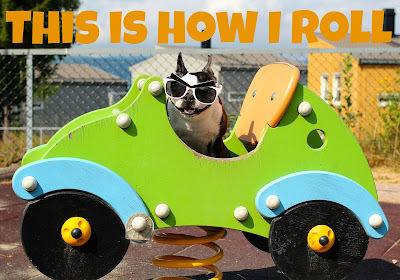 The Boston Terrier breed originated around 1870, when Robert C. Hooper of Boston, purchased a dog known as Hooper's Judge, who was of a Bull and Terrier type lineage. Hooper's Judge is either directly related to the original Bull and Terrier breeds of the 18th and early 19th centuries, or Judge is the result of modern English Bulldogs being crossed into terriers created in the 1860's for show purposes, like the White English Terrier. 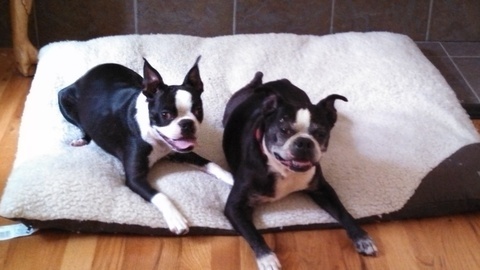 These two are a bonded pair, ages 8 and 6. They found their way to NEBTR through the Montgomery City SPCA. They are clearly attached to each other, and we are hoping to keep them as a pair, since they have lost everything else. Thanks to Loretta Dolan for opening her heart and home to these boys! She says, “These boys are WONDERFUL! I couldn’t be more lucky in getting them as fosters!” We think they are the lucky ones in being able to stay with you! She loves coming to work with me and getting extra treats from my co-workers. She gets extra pettings and kisses, as well!!! Power naps are required on the job for Patsy!!! My foster Spot enjoying the sun! Foster spot on the right with my female. They finally sat for a picture! Here's the happy boy. He LOVES to go for walks. Gets so excited! Patsy loves the new food bowl station that I purchased for her. She has gained another half pound and she's not feeling insecure about the weight gain...LOL!!! She is such a sweet girl!!! She's precious! Mum’s the word on the weight gain we won't tell her . . .
Augie in the yard. I can't wait until he gets his staples out this week. He will be one happy dog. He has managed to rub and roll until he pops the donut off but only when he first sees us and is excited. He has be great with going out as long as we don't let him go too long outside of the crate. He is now gong to the door which he wasn't before so I am pleases that he is progressing a little. I spoke to the Franks yesterday to see how everything has been going with Gizzy. They said that he has settled in quickly and is already best friends with their 12 y/o, deaf Jack Russell named Jack. They said they haven't seen Jack play this much in years! He is becoming more comfortable with the men in the house but is still a bit nervous. He has a huge yard and a beach to run around in and they adore him. They sent me 15 pictures yesterday so here are a couple. This was such a perfect match and we're so happy they found each other. What great news for Gizmo and his new family. I love it when the family knows that they hit the jackpot with a really good dog! I'm sure Gizmo can't believe how wonderful life has become. Thanks so much to Christine Morse for opening up her heart and home to this beautiful boy! What a wonderful video! Mickey's living a dog's life. A good home can make all the difference, thank you Maria. How cute is she. Mom, I'm hungry! Why Does Your Boston Lick? You’re taking a moment to relax in front of the television. The family dog wanders over to you and plops down at your feet. Your furry canine friend begins to lick the exposed skin on your leg and continues until you’re all slobbered up. The licking continues until you feel that your skin has been cleaned to the point where it may disappear. Most dogs are so intent on the licking process that you know there has to be a good reason for doing it. Some people say the dog’s licks are canine kisses that prove the dog likes or loves you. Fido is showing you that he cares about you. While this may be one reason that dogs lick people, it is clearly not the only reason why they perform this act. Licking is also a submissive gesture. In the wild, the more subordinate dogs will lick the more dominant ones. This helps to maintain harmony among the members of the pack. By licking you, the dog is showing you that you are the dominant being and you are in charge. Another reason that dogs lick humans is to gather information about them. Dogs use the scent receptors located in their nose and mouth to process information about a person. A person who is secreting sweat from his or her body is actually unknowingly sending information about him or herself to the dog. This is one reason why a human’s feet are so attractive to a dog. Human feet contain many sweat glands. Eccrine glands release moisture that contains salts, water and waste products. Some dogs love the taste of salt. Dogs also enjoy licking because the act releases endorphins that allow the dog to feel pleasure and a sense of security and comfort. While dogs do have good reasons for licking people, some folks don’t understand nor do they care to try to grasp why they are being slobbered on. It is important to train your dog in a manner that he or she does not get carried away with the tendency to lick people. Alaina petting our adopted girl Zoey.